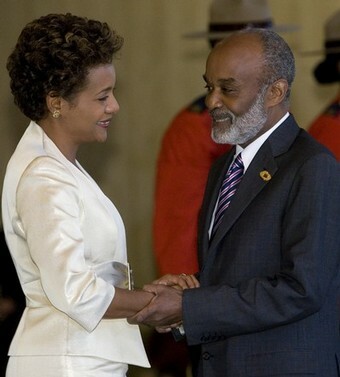 I see that the President of Haiti Rene Preval welcoming Michaelle Jean who is not only a beautiful lady but have a good head and know what she is doing. To me the look on President Rene Preval face was a look of a welcome way over do. He was happy to be there to welcome her. I told my friend "look at those two, man we are some good looking Haitian." I was and still happy to say that. My friend said yes they are and I didn't have to tell her who the lady in the picture was. Why do we Haitian do that to each other? Plz show me how your dirty mind was able to detect "flirt"in that picture. This is the woman you nuts want to be president of Haiti.You are out of your mind.Don't you see that she is flirting with Preval in broad daylight. The way President Preval shake hands by grabbing the entire persons wrist prove that he is a professional "voleur" no doubt. It's at his subconsious level.